Description: It Came From the '70s is the book movie lovers old and new have been searching for. The 1970s represented a fertile decade that produced such films as: Alien, Dirty Harry, Apocalypse Now, The Exorcist, Chinatown, The French Connection, Close Encounters of the Third Kind, The Godfather (Parts I and II), Star Wars, One Flew Over the Cuckoo's Nest, and many, many more. Featured in these pages are over 75 photos, major casts, a multitude of reviews, "Best of/Worst of" lists, and trivia for both the film buff and the uninitiated. It Came From the '70s is a slice of film history, painstakingly documented by noted author and journalist Connie Corcoran Wilson. The original reviews found here could not be replicated today. Consider them tiny time capsules capturing the zeitgeist of a decade. It Came from The '70s by Connie Corcoran Wilson is a selection of movie reviews Connie wrote in the seventies for the Quad City Times of Davenport Iowa. Connie writes: "I saved almost all of my original reviews in scrapbooks....They've been there for 39 years. Now, they're coming out to play.(pg. 4)." Movie aficionados who know or remember movies from the seventies are in for a treat. Movie reviews in It Came from The '70s include: the title of the movie; the year it was released; the number of stars Connie gave it (on a 1-4 scale); the date and/or the year it was originally reviewed; her review (some of them include current comments); pictures that can include scenes from the movie, the poster, and/or the ad the cinema put in the newspaper showing the dates and times; a list of the cast and crew; and trivia questions and answers. For movie fans the trivia is a great addition. Obviously, all the movies Connie reviewed in the seventies are not included, but she has chosen a great selection. The list of movies Connie included in her book are: Alien; Apocalypse Now; The Black Hole; Burnt Offerings; Carrie; The Cassandra Crossing; The China Syndrome; Chinatown; Close Encounters of the Third Kind; Coma; The Deep; Dog Day Afternoon; Dracula; Exorcist II: The Heretic; Freaky Friday; The French Connection; The Fury; The Godfather and The Godfather II; Halloween; Infra-Man; Invasion of the Body Snatchers; King Kong; Logan's Run; The Man Who Fell to Earth; Magic; Manhattan and Annie Hall; Marathon Man; Moonraker; Nosferatu; Obsession; One Flew Over the Cuckoo's Nest; Rocky; The Seven-Per-Cent Solution; The Sailor Who Fell From Grace with the Sea; Saturday Night Fever; Sinbad and the Eye of the Tiger; The Sorcerer; Star Trek: The Motion Picture; Star Wars; Superman; Time After Time; Twilight's Last Gleaming; Two Minute Warning; When a Stranger Calls; Kong, Cuckoo, Omen Movies to Top Ten; Best and Worst Films of 1976; Best and Worst Films of 1977; Best and Worst Films of 1978; Best and Worst Films of 1979. From Close Encounters of the Third Kind: "The Mother Ship appears to be gigantic as it descends atop Devil's Tower, but it is, in reality, barely 3 feet in diameter. It is an amazing miniature, complete with underside observation ports and tens of thousands of tiny holes 10 to 24 thousandths of an inch in width. They're individually capped with plastic bubbles and illuminated from within by more than 1,000 neon tubes. (pg. 51)"
From Logan's Run: "The story starts to crumble about the time the pair reached a frozen cave inhabited by a robot named Box. Even their later encounter with Peter Ustinov as a senile old man who lives with 100 cats in the ruins of the Senate Office Building and quotes T.S. Eliot to the runaways cannot save the picture at that point, especially since Ustinov sounds like a cross between the regular speaking voice of Jim Backus and that of Mr. Magoo. (pg. 123)"
Speaking of Logan's Run, Connie met the author, William F. Nolan and sent me a picture of them. From Magic: "The familiar Hitchcock technique of alerting the audience that something is going to happen and then letting them stew about when it will happen drives the plot. (pg. 129)"
From Saturday Night Fever: "As a dancer, Travolta may single-handedly do more for popular disco dancing than Rudolf Nureyev did for ballet. Travolta displays the lithe grace of a panther and supreme macho self-confidence in the disco scenes, while the discotheque crowd falls back as though in anticipation. (pg. 179)"
From the Worst of 1978: "Number One: Grease. A big disappointment to me....Sill, the songs are catchy. (pg. 246)"
You know, I never liked Grease either and it warmed my little heart to read this. I never liked it because the very shallow message it seemed to be sending was that young women must change themselves in order to get the man. Let me just say, "Bologna" rather than another B word. The verdict is that I very much enjoyed It Came from The '70s and would Very Highly Recommend it. The Movie Dude is going to love this book. Disclosure: I received a copy of this book from the author for review as a part of the Premier Virtual Author Book Tours. 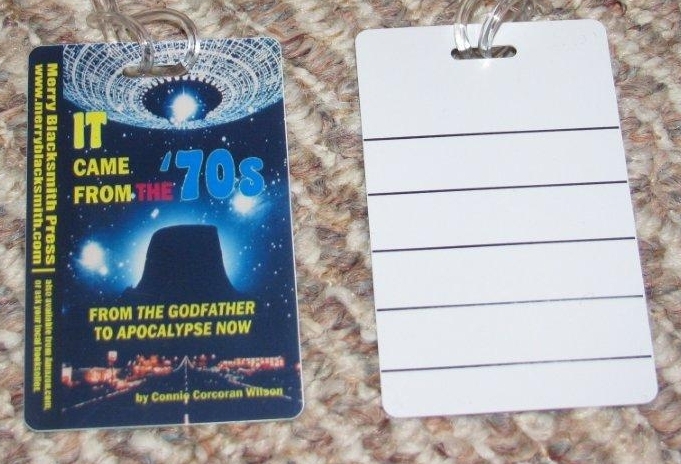 Connie is giving away cool It Came from the '70s luggage tags to 10 of my lucky readers. In addition, she will send the winners a short story "sneak preview" of her upcoming short story collection, Hellfire & Damnation II, the sequel to Hellfire & Damnation (all available on Kindle right now; short story title "The Bureau.") She welcomes reviews of "The Bureau" on Amazon.com and Barnesandnoble.com, as well as comments or reviews of It Came From the 70's on Amazon.com. Additionally, if you purchase a copy of It Came from the '70s and post a review for it on BarnesandNoble.com and/or Amazon.com, Connie will send you her new novel, about to be released on Kindle, The Color of Evil. The Color of Evil is a thriller about a young boy with paranormal abilities. You can even suggest plot directions to Connie by e-mail for this first-in-a-series novel and, if you wish, Connie will use your name as a character in the novel. Both "The Bureau" (6,500 word short story) and The Color of Evil (80,000 word novel, Book One) will be sent to you by e-mail, free of charge, as a Microsoft Word document to read on your computer. After you have reviewed It Came from the '70s on BarnesandNoble.com and/or Amazon.com, Please send Connie a link at EINNOC10@Aol.com, with Book Tour Review in the subject line, to claim your free copy of The Color of Evil. +2: a comment gives you an entry. I'll give you up to 2 entries if you can find 2 unique things to say. up to +2 more entries if you comment on the two 70's Movie Dude Weekend posts. That gives you up to 10 ways to win one of the 10 luggage tags! I will use a random number generator to pick winners on the evening of July 30, 2011. Wow, she really covers a lot of movies from the 70's! I have seen so many of them, what a great decade for movies. Just reading the list of movies she reviewed brings back memories!! Did I really see that many movies in the 1970's!!!!!!! I FORGOT about The Black Hole! We weeded a flower bed & some in the garden this evening. I'm beat. Ok, this one doesn't count. lol Just bein' goofy. I do follow you already here at blogger, don't I? P.S. I just started the Erik Larson book you reviewed a few weeks ago, In the Garden of Beasts.